Don’t run out to the furniture store just yet! There’s a great chance that we may be able to revive the furniture that’s sitting right in your living room. We also take care of all kinds of window treatments and drapes. New Yorker’s Carpet Cleaners is truly your one-stop shop for all your professional cleaning needs. Why not let one of our trained professionals into your home today to see what kind of improvements we can make? How Can We Help Your Furniture? Your furniture takes just as much of a beating as your carpet, but doesn’t receive the same kind of attention when cleaning day comes around. Over the course of your furniture’s life, it’s subjected to thousands of hours of abuse. Of course, there is the damage you can see from all of this use-torn fabric, broken legs, stains. We can repair all of this. Aside from this physical damage, however, something deeper lurks beneath the surface. Bacteria and germs love to burrow into the fabric. You and your family spend so much time lounging on your furniture. Isn’t it worth the extra money to make sure your pieces are completely clean? We clean your furniture and upholstery using the most advanced technology and cleaning solutions on the market. This process uses a two step hot water extraction process to get your pieces back in great shape. 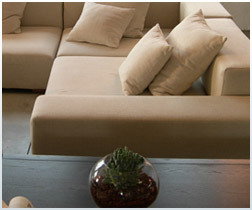 First we remove particles from the surface of the upholstery by applying a specially formulated PH-balancing solution. Next, a steady stream of hot water is used to clean the surface. After the hot water is applied, we’ll gently brush the fabric, removing any dirt particles. The next step is the most important. After the cleaning is finished, our technicians will apply Scotch Guard Protection. When you initially purchased your furniture, the surface was protected by Scotch Guard (or a similar protectant). Over time, however, this layer of protection wears off. This is the first line of defense against spills and dirt buildup, so it’s important to make sure that it’s up to the task. Finally, we’ll spray an enzyme-based deodorizer on the surface. This will keep your furniture smelling fresh and clean, while keeping bacteria at bay.